Yesterday, I hosted a Q&A call for participants in the "7-Step Product Creation Challenge" -- a self-guided program to help career industry professionals develop their first -- or NEXT -- information product. Here are five tips that I shared on the Q&A call that may help you create your information product -- whether that's an ebook, tip sheet, membership program, webinar/teleseminar, live program, or self-study program for jobseekers. The first tip is START WITH YOUR WHY. What is your motivation for creating an information product? The two biggest "whys" for resume writers and career coaches is usually one -- or both -- of two things. The first reason to create an information product is to generate passive income (and/or recurring revenue) in your business. 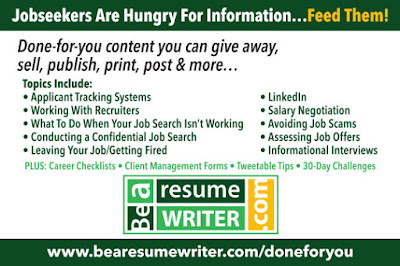 For most resume writers, they are only making money when they are directly serving clients (1-to-1 work). An information product allows you to make money even while you're sleeping, while you're doing "family things" or even when you're serving clients! The second tip is START EASY AND CREATE OFTEN! Many career services professionals I talk to want to create something big, like a home study training program or a hardcopy book. Instead, if you're creating your first information product, start with something small -- a tip sheet, an ebook, or a teleseminar. Once you've created one, you'll find it easier to do another one! But DON'T REINVENT THE WHEEL. That's tip number three. Do you already have something done that you can re-use? Look through your email inbox and see what questions you answer over and over again for clients. Then take the content that you've already sent to clients (copy-and-paste from your emails!) and do something with it! And don't forget that Pass-Along Materials are ready-to-go content you can put to work right away! The fourth tip is to DEVELOP ONCE AND PROMOTE OFTEN! Once you've created your first (or next!) information product, your work isn't done! The next step is to continue to promote it! You can't just "build it and they will come." Make it a point to promote your product -- post about it on social media. Do guest blog posts or be a guest on podcasts where your ideal client for that product hangs out! Excerpt it! Finally, JUST GET STARTED! One thing I said over and over again on the call was: "Done is better than perfect!" You can always go back and add to the information product. But getting something done and out there is a huge motivator! If you want help creating an information product for your career services business, take the 7-Step Product Creation Challenge! It's just $37 for the self-guided program. It walks you through the process, step-by-step!